We are slightly obsessed with Strawberry Shortcake in our house right now. (Well... Ana is... my obsession was about 30+ years ago.) For Christmas all Ana asked Santa for was "Tiny Strawberry Shortcake and all of her friends... and big Strawberry Shortcake and all of her friends." Lets just say there are a few fruity smelling dolls in our house right now. So, when I was giving the opportunity to receive a copy of the new Strawberry Shortcake: Bright Lights, Big Dreams I was pretty quick with the "yes, please!" response. - Great to be able to take along a favorite TV show in the car. - What's not to like about solving problems, trying your hardest, and being a good friend? - The idea of bonus material printable coloring pages. - It's not a new "movie". It's episodes we've watched (over and over) on TV. - In general, Nick has repeatedly told me that Strawberry Shortcake is the girliest girl show he's ever seen. The little girl fights and quarrels. The worrying over what the friends are thinking. The giggling. The pink. Not necessarily a negative for my girly girls... but it can get to be a bit much when you watch it OVER and OVER and OVER. - The bonus material includes printable coloring pages... but no matter what I tried I just couldn't get them to open on our computer (even though we have the correct hardware and software.) Maybe I'm doing something wrong... or maybe it's not really on our DVD? I was a fan of Strawberry Shortcake when I was little. My girls are fans now. What do you think of Strawberry Shortcake and her pals? 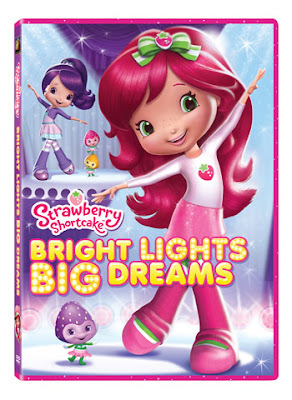 Disclosure: I was sent a Strawberry Shortcake:Bright Lights, Big Dreams DVD and was asked to do a review. All of the thoughts expressed are my own. Excuse me... where did December go?